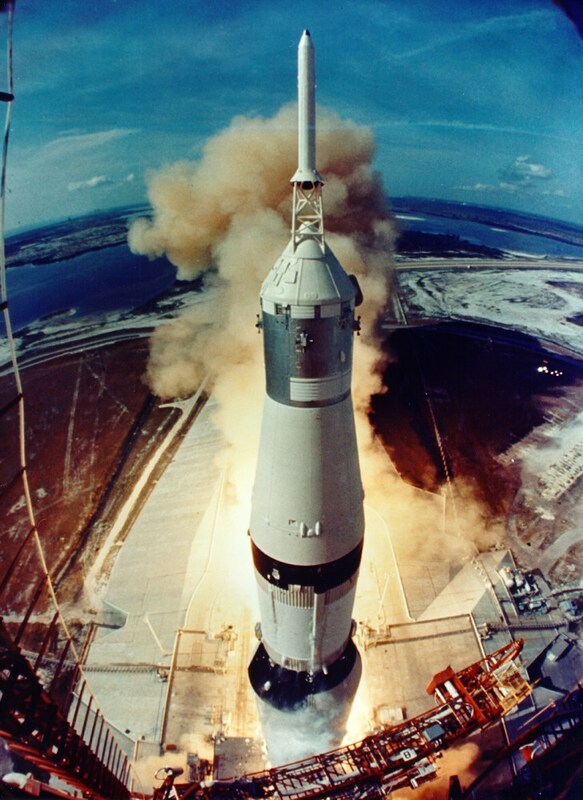 July 16, 2014 – Today marks the 45th anniversary of the launch of Apollo 11 from Cape Kennedy. A Saturn V rocket was used to launch the capsule that carried Commander Neil Armstrong, Command Module Pilot Michael Collins and Lunar Module Pilot Edwin “Buzz” Aldrin on their journey to the moon. It had been only eight years since President John F. Kennedy announced the goal of sending astronauts to the moon before the end of the decade. Kennedy’s bold challenge galvanized America and put thousands of people to work to make the moon landing possible. Aldrin later said that when they launched, the astronauts knew they had only about a 50% chance for survival, but that it was worth the risk; they were setting out on a journey unlike any other in human history. In addition to its primary mission of landing humans on the moon and bringing them home again, the mission included scientific exploration by the lunar module crew; deployment of a television camera to transmit signals to Earth; and deployment of a solar wind composition experiment, seismic experiment package and a Laser Ranging Retroreflector. On July 20, 1969 an estimated 530 million people would watch Armstrong’s televised image and hear his voice describe the event as he took, “one small step for a man, one giant leap for mankind.” It was one of the most remarkable feats of the twentieth century and one that still excites and inspires the imagination to this day.